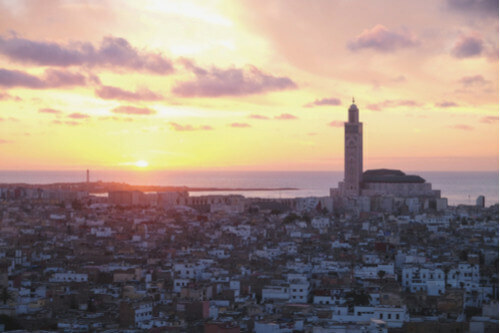 Casablanca may not rank as high on most people’s must-see list but it is where the heart of Morocco lies. The commerical and economic center of the country, it is located in central-western Morocco and boasts the bustling Port of Casablanca, one of the largest artificial ports in the world and the second largest port in North Africa. A city that sports hallmarks of its past as a French colony and rich Arab culture, its vibrant streets are lined with art deco buildings sitting side-by-side with old stone medina alleyways, European style cafes and an old Portugese style fortress with ramparts that offer a view over the Atlantic Ocean. Whether you’re in Casbalanca for a day or just a few hours, here’s a snapshot of what to see and do. If stepping inside a mosque in Morocco is high on your list of priorities, the iconic Hassan II Mosque is one of the few that welcome non-Muslims on a guided tour (selected timings everyday except Fridays) of this religious building. 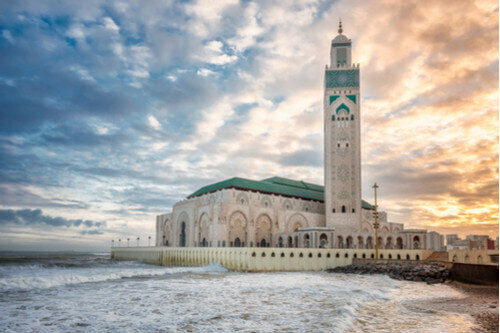 Constructed in the 1990s, in commeration of the 60th birthday of Morocco’s former king, it is the largest mosque in Africa with a minaret of 210 metres, the highest in the world. Decorated with intricate tiles – more than 10,000 m2 of zellige was used – beautiful carvings and an unusual glass floor, allowing worshippers to feel like they’re praying directly over the ocean. Said to accommodate up to 25,000 worshippers, the spacious courtyard that’s open to all can hold an additional 80,000 people. The promenade that runs alongside the mosque also serves as a prime people watching spot with food vendors, strolling locals and the odd soccer game taking place. Modest dress is expected and bring a pair of socks as you will have to remove all footwear before entering. Unlike Fez’s maze-like medina, Casablanca’s medina is a little easier to navigate. 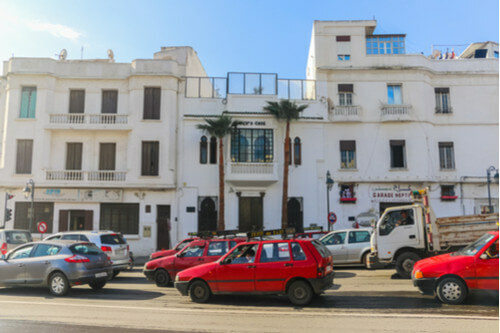 Located near the Hassan II Mosque, the entrance through Bab Marrakech on Ave Tahar El Alaoui is where most of the shops are. Less touristy than the medinas in Fez and Marrakech, the shops here offer more day-to-day necessities – knife sharpeners, tailors, fruit stalls, spice sellers – but is rich in its offer of what a day in a life of a Casa local looks like. For Casablanca fans, seek out Rick’s Café, a reproduction of the bar complete with a 1930s piano, featured in the Hollywood classic. Thanks to the French and their grand architectural dreams, the city has a number of buildings that make for more than just a pretty postcard. Navigate to the Cathédrale du Sacré Coeur (Sacre Coeur Cathedral), built in the 1930s by architect Paul Turnon and used as a Christian place of worship till the 1950s. While it’s since been abandoned, it’s all-white façade is still impressive with its two dome bell chambers and arched entrance and visitors are welcome access the towers for a breathtaking view of the Atlantic Ocean. Equally impressive is the Notre Dame de Lourdes with its elongated structure and high roof. 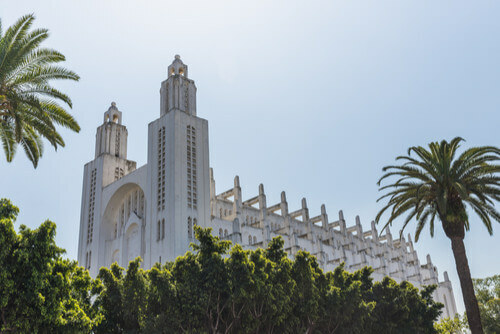 Built in the 1950s with beautiful stained glass, it’s an impressive example of modernist architecture. Set up with the ONA foundation, the Villa des Arts is Casablanca’s largest museum which is located inside an elegant 1930s art deco mansion. Situated near the Parc de la Ligue Arabe, it showcases 800 contemporary artworks through the lens of Morocco’s culture and heritage with temporary exhibitions by visiting contemporary artists. 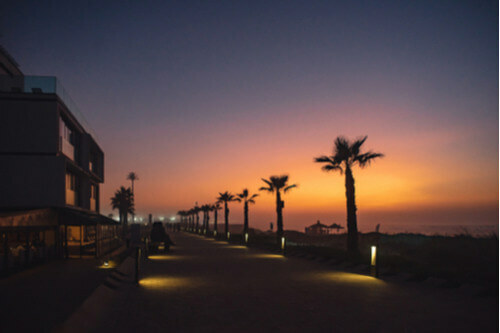 This busy beachfront stretch of nightclubs, cafes and restaurants is busiest during the summer where locals hang out and enjoy the balmy summer weather at one of the many pools and beaches. By nightfall, the area is popular as a pre/post dinner promenading spot.